Jerome d'Ambrosio has split his career between single-seater and sports car racing but has made clear that his goal is to race in Formula One. After driving for DAMS in GP2 for three seasons, he secured his dream of a race seat at Virgin and made his F1 debut as team-mate to Timo Glock in 2011. 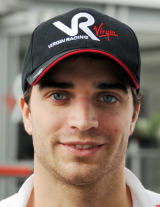 After a solid rookie year his future is unclear as Charles Pic replaces him for the 2012 season. He showed promise from an early age, winning the World Karting Championship in 2002 before going on to win the entry-level Formula Renault Series in Belgium the following year. In 2004 he moved into Formula Renault and scrapped for podium places in both the French and Italian series as well as racing in the occasional Euroseries event. He also competed in a handful of FIA GT and Belgian GT sports car races before he found his feet in the single-seater Formula Masters series, taking the title in 2007. That success opened the door to the GP2 Asia Series where he finished second overall behind Sauber driver Kamui Kobayashi. A full season in the more competitive European championship came next and he scored two podiums in Valencia and Spa Francorchamps. His 2009 season started with promise as he scored three podiums in the first four races, however, a mid-season slump and five retirements meant he finished the series ninth overall. In 2010 he won the Monaco sprint race but lost his seat to Romain Grosjean at the German round and only finished 12th overall. Nevertheless, money from his management company Gravity Sport (which is owned by Renault majority shareholder Genii Capital) secured him a series of Friday tests with Virgin that eventually led to him being offered the 2011 drive. While Glock provided a solid barometer to measure his performances against, two 14th places and a higher finishing position than his team-mate in the drivers' championship were not enough to save his seat. It was announced after the Brazilian Grand Prix that Charles Pic would replace him in 2012. However, d'Ambrosio had to wait less than a year for his next grand prix call up, as his role as Lotus's third driver resulted in him being drafted in to replace the banned Romain Grosjean at the 2012 Italian Grand Prix. A strong racer, he almost always finishes higher than his qualifying position. However, this is also due to his lack of pace over one lap. Winning the 2002 World Karting Championship. It should have set him up for greater things earlier in his career, but proves he has plenty of potential. Crashing out of both GP2 races at his home grand prix at Spa-Francorchamps in 2009. D'Ambrosio on Spa Francorchamps: "I like it all the more since racing in GP2. The speed and power of the car make Eau Rouge and Blanchimont real balls-out corners!" When asked what his motto is, d'Ambrosio quoted James Dean: "Dream as if you live forever, live as if you will die today".